If you’re serious about building a mining rig, then chances are you’ve spent a large chunk of change on some of the top rated GPUs for your Ethereum Mining Rig. And if that’s true, you didn’t come all this way to have your precious GPUs overheat inside your mining rig! Don’t fret – there is a simple solution. You just need to space your cards apart and give them some air to breathe. Get them up away from the warm (and air-blocking) motherboard, up into the open airspace where their fans can pull in a cool refreshing blast of air from your (likely) dingy basement [okay maybe that’s just me]. What you need is a USB riser – also known as a GPU riser, GPU extension cable, powered riser cable, PCI-e riser et al. It allows you a cable to plug one end into your motherboard and the other end (up to 12 or 24 inches away) into your GPU. This gives you the air and heat separation you need in order to build a stable, overclocked, and most importantly profitable ether mining rig. It converts your PCI-e 1x slots into a 16x slot so that you can plug a modern top rated mining GPU into the older style PCI express slot. Awesomely, since the mining process on the GPU doesn’t require the 16 channel connection that it would if you were building a gaming computer, no mining speed is lost! Where will you source your power? 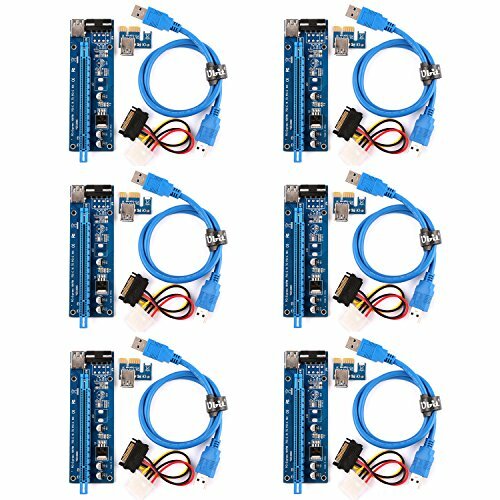 If you plan to have power come through your motherboard, than you don’t need a powered riser cable, you simply need a PCIe 16x to 1x conversion cable. 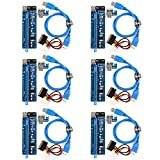 To be safe, and to save your motherboard from frying (and maybe taking out your GPUs with it), just spend the few dollars more and buy powered USB risers for your mining rig build please! Once you’ve determined your power source, figure out what kind of connections you need to get the power to the GPU riser cards. On my build, my power supply has multiple VGA and peripheral power outputs that aren’t being used so I can tap into those and power my GPUs. My power supply also came with plenty of extra cables that will plug into those output and allow me to connect to something with a molex plug – and what do you know? That’s just what these USB riser cards have – a molex connector 🙂 Done and done. If you don’t have a large mining rig, or you’ve decided to mount a few of your mining GPUs directly to your motherboard, than you can buy a single PCI-e 16x to 1x powered riser adapter card. Just keep in mind it costs more – if you will need more in the future, just buy a 6 pack now and almost $5 per riser! The VER 006C riser kits are just what you need if you’re building an ethereum or other GPU mining rig. Whether a small open air or large rack-based mining setup, this will provide you with what you need to connect multiple GPUs to your rig’s mining motherboard. The power is supplied through a MOLEX 4 pin connector on the riser card, which allows you to bring power directly from your PSU to the riser card thus lowering the power burden on your motherboard. The ethereum mining riser cards come with 4 high quality capacitors, which they say makes it more reliable and a better choice than some of the competitors that only have 3 capacitors per card. The board has 3 holes for securing it to your case, and effectively connects your PCI-e 16x mining GPU to a PCI-e 1x slot on your motherboard without affecting mining speed. These usb risers are much cheaper than some of the other options, and these are the ones I decided to go with. Some purchasers claim to have received some dead-on-arrival risers, but all of the recent reviews are good so I decided to give them a chance and save almost 30% over some of the units from bigger name brands in the space. Mintcell is as close as you’ll get to a name-brand in the riser cable world. Their Amazon listing has a specific warning to make sure that you are buying directly from them, and not some ‘other’ supplier. 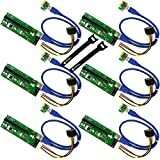 These riser kits are the perfect solution for setting up a crypto mining rig like Ethereum mining rigs. There are 3 high quality capacitors on each riser for safe and reliable delivery of power to your GPU. 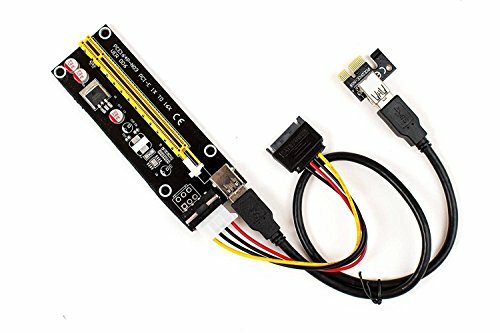 The USB cable is 60cm long, and the SATA 15-pin connector has a molex plug on the GPU riser side, meaning you could use a molex power supply cable and bring power to the riser and GPU directly from your power supply unit, rather than having the power going through your mining motherboard (this is especially important when multiple GPUs are pulling high power and can cause your motherboard to burn out!). For my build, I am using GTX 1060 series cards that will be detuned to run as low noise/heat/power as possible so I will not be using as much power as some other GPUs would.